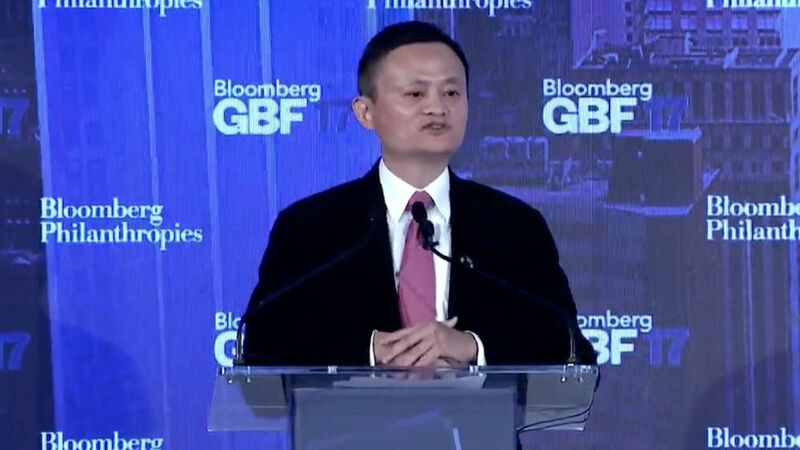 Jack Ma, founder and CEO of Alibaba, spoke about the future of work at the Bloomberg Global Business Forum Wednesday, warning governments to pay attention to the next 30 years, to those under 30 years old, and to small businesses — "I believe the small is beautiful and is powerful." He also zeroed in on how the servic industry, not manufacturing, will be the driver of job creation. Man vs. Machine: Ma said there are a lot of people with worries, but most overestimate what this new technological revolution will bring to the world. He said that machines will be faster and stronger than humans, but "human beings have the heart, soul, beliefs and value." Manufacturing is no longer the main driver of job creation, said Ma. Soon, the "service industry is going to be the main driver... So in talking about manufacturing, we should not be talking made in China, made in America. It's going to be made in internet." "If you want in this world to be successful you must have the IQ, EQ, and LQ... the Q of love, which machines never have." Ma says people should not think about artificial or human intelligence, but about machine intelligence. Ma also notes that humans only use 10% of their brains, so "if we want to make the machines think like men, we will be in big trouble." "Nobody is the expert of future and we have limited knowledge about the digital time, so I think we are entering a world where everybody starts to worry. And those people who say, 'I believe the future,' they're considered as some crazy guys... but 100 years ago when electricity came, people worried [it was] going to take a lot of jobs." In the past 30 years, we made people like machines, said Ma. In the next 30 years, we'll make the machines like people. "The first tech revolution caused WWI, the second caused WWII," said Ma, adding that now our society may be facing WWIII, which should be war against poverty, disease and environment pollutions.